A dual flush toilet is a toilet that offers the consumer the ability to have the option of having a full or half flush. Designed with the intention of reducing the amount of water consumed in comparison to standard toilets. Did you know that the flushing of a toilet is one the major appliances in a home or business that consumes copious amounts of water? Did you know that single flush toilets flush at a standard rate of 1.28 gallons per flush – whereas a dual flush toilet offers the option of using almost half the amount of water per flush. The option of a dual flush means that users can choose a half flush for liquid waste and a full flush for solid waste. Dual flush toilets often are WaterSense certified for that amount or rather lack of water used in comparison to other toilets in the market. We list the best Dual Flush toilets in the market that are worth a consideration. It is a compact dual flush toilet that is suitable for installation in commercial or residential buildings where space is limited. It is a simple dual flush toilet fixture uses approximately 1.6 gallons per flush making it a WaterSense certified toilet. Durable and quality based, the American Standard H2Option dual flush toilet offers consumers a simple space saving toilet solution. 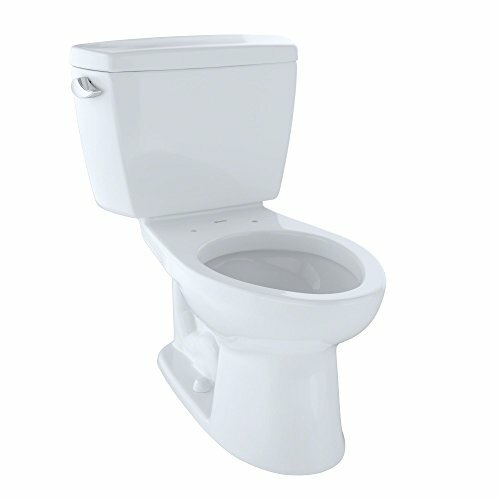 A one-piece toilet with an elongated bowl, it offers a unique dual flush with 0.8 per half flush and 1.0 gallons per full flush. AquaPiston technology means that with every flush there is less water consumption compared to standard toilet flushing. The dual-flush system means one can choose the light flush or the heavy flush; therefore, giving flush options. The Woodbridge T-0019 dual flush elongated one-piece is a modern and simple toilet. It is a compact dual flush toilet that is suitable for installation in commercial or residential buildings where space is limited. Designed with a flexible dual flush system, it is very much a water efficient toilet. Offering a siphon flushing design, the powerful flush does not emit as much sound and noise as one would think for standard toilets. The Woodbridge T-0019’s water efficiency with a dual flush makes it a toilet that can save a consumer nearly 16,500 gallons per years. It offers advance technology when it comes to toilets, especially, a dual flush toilet. With a build-in LED night light, an energy save mode as well as a warm water heater, the Woodbridge dual flush toilet is most definitely the luxury end of dual flush toilets in the market. With the dual flush system, the Woodbridge can consume anywhere between 1 to 1.6 gallons with an average of 1.28 gallons per flush. With a narrow width, the Woodbridge offers a comfort height for those who have mobile impairment or struggle with sitting and standing. It has a skirted design which to some makes it not rest flat; however, the benefit is that it does make it easy to clean. It also has a quick release for the seat which aids in the cleaning of it. Speaking of cleaning, the Woodbridge T-0019 offers a posterior, feminine and pulsating wash – truly giving a unique dual flush toilet experience. While most toilets don’t always require professional installation, the Woodbridge T-0019 is a toilet that professional installation is recommended. For the adventurous installer, there are special tools that come with the purchase of the toilet. If you are looking for something that offers a dual flush system, why not go with the TOTO Aquia Wall-Hung dual flush toilet bowl. The TOTO Aquia is a dual flush and compact toilet. The TOTO toilet seats approximately 17 to 19 inches from the ground providing extra storage space. This dual flush toilet is designed with elegance and modernity in mind. It is a simple dual flush toilet fixture uses approximately 1.6 gallons per flush making it a WaterSense certified toilet. Operating on a dual-flush system, it offers a powerful performance and has a SanaGloss ceramic bowl. The SanaGloss coating prevents the possibility of bacteria, mildew and mold which means less routine cleaning and maintenance. Another benefit of this easy to maintain low profile toilet is that it can be adjusted to the ideal height – whether that is a comfort height or that of a low toilet. When it comes to the actual tank of this wall-hung dual flush toilet, it does come with a wall tank system that is non-invasive. This dual flush toilet offers an elongated toilet design giving it a truly modern and clean finish – ideal for any residential powder or half bathroom. A space saver and environmentally friendly, the TOTO Aquia wall-hung dual flush toilet has a CalGreen certification meaning that the waste that comes from the toilet can be used as a sustainable and renewable product. A double flush toilet, the TOTO Aquia promotes hygiene and versatility all in one. Its dual flush system paired with its innovative technology means that it requires minimal water per flush. The American Standard H2Option Siphonic is a dual flush toilet made of vitreous china. Unlike some toilets, this model is sold as a 2-piece with an elongated toilet seat. Considered a high-efficiency toilet with WaterSense certification and HET (High-Efficiency Toilet), this is a dual flush toilet for those who are environmentally conscientious about water consumption. For those who are not overly concerned about style and appeal, the American Standard offers a clean and standard toilet design. Made with a siphon dual flush combination, its flush lever is chrome plated. The American Standard H2Option has a 2” fully glazed trapway as well as an EverClean surface coating which means that consumers can worry less about having to clean it routinely for fear of staining or mess. In comparison to other elongated dual flush toilets, this model is a round shape which means that installing this model won’t take up as much space or stick out in comparison to elongated seats. Designed with a dual-flush system, the American Standard H2Option Siphonic Dual Flush consumes approximately 1.6 gallons per flush and 1 gallon per half flush. It’s pressurized flushing and plumbing prevents the potential for any backlogs or clogging. Durable and quality based, the American Standard H2Option dual flush toilet offers consumers a simple space saving toilet solution. It is compact in size and offers additional features to enhance the compact dual flush toilet itself – for example, if your bathroom is prone to high levels of humidity or you are worried about condensation, mold or mildew build up, one can purchase an AquaGuard liner to prevent this in their American Standard H2Option dual flush toilet. Commercial or residential, this compact toilet meets the minimum space requirements of a building. The TOTO Neorest 700H is considered one of the best all-around dual flush toilets in the market. A one-piece toilet with an elongated bowl, it offers a unique dual flush with 0.8 per half flush and 1.0 gallons per full flush. The TOTO Neorest is the perfect mix of luxury and class with the capacities of a water conscientious user. Compared to dual flush toilets in the market, this TOTO toilet has a powerful flush where the water is flushed and returned into an environmentally useable water. The KOHLER Wellworth two-piece dual flush round seat, is an ideal toilet for those seeking a standard and functional clean toilet that also offers a dual flush system. Designed with a height of 17.5 inches, this two-piece dual flush comfort height toilet makes sitting and standing easy for those with mobility issues. Made from china with a round seat, the KOHLER Wellworth dual-flush two-piece uses an AquaPiston technology. AquaPiston technology means that with every flush there is less water consumption compared to standard toilet flushing. The innovative AquaPiston technology results in efficient and consistent water flow from all angles, not to mention the yellow seal on the gasket of the piston creates a suction to reduce leaking, shrinking and swelling. Designed with innovation and efficiency in mind, the Kohler Wellworth also features a light-touch flush meaning this KOHLER model’s flapper requires less force than a standard toilet flapper. With 1.6 gallons consumed per flush, this single-flush toilet uses gravity and a specially designed and engineered tank that creates a powerful siphon. When it comes to the installation of this model, it is equipped with a DryLock System, which not only speeds up the installation process but also helps prevent possible leaking. Aesthetically, this comfort dual-flush toilet is slightly taller than standard comfort height models; however, the KOHLER Wellworth’s exterior offers a modern appeal that comes in the colours of biscuit, black, white and sandbar. The round bowl offers more room and comfort. The KOHLER Wellworth toilet is the perfect aesthetic toilet for any homeowner looking to add a touch of elegance. Subtle in style, its size is suitable in a hall or full bathroom, not to mention this model is considered the ideal dual flush toilet for prevention of clogging. Considered one of the best compact toilets for small bathrooms due to its performance and functionality, the Galba Small Toilet is a contender in our Top 10 compact toilets. Offering a powerful flush, it can handle bulk and heavy solid wastes. Small and powerful is the Galba Small Toilet. Designed with elongated toilet dimensions of 24.5 x 14 x 27, this is truly one of the most compact toilets on the market – not to mention it only weights 90 lbs. This one-piece elongated concealed trapway offers a self-cleaning glazed surface meaning it won’t rust, scratch, fade or discolor. It measures at approximately 12” from wall to seat. Made of a harder plastic, it still adheres to the National standards for toilet requirements. While the seat that is purchased is not one that customers might not like, it is interchangeable and customizable to suit one’s seat preference. When it comes to flushing, it does not fill fully, unlike most toilets in the market which means the bowl will require more or frequent cleaning; however, thankfully, the material is one that does not discolor or rust. The dual-flush system means one can choose the light flush or the heavy flush; therefore, giving flush options. An ideal choice for those seeking a space saving toilet – the Galba offers functionality and style. With 3” flush valve, this compact, narrow toilet is one that’s powerful and eco-friendly. For some it is important to consider the overall height of the compact toilet. Some compact toilets, while they may be considered a space saving toilet can still take up vertical space; therefore, when shopping for a compact toilet it is important to consider whether you want one that is a shorter toilet than the standard height or if a low height toilet suits the compactness you seek. The shape of a toilet seat is just as important as the height. It is important to consider whether one wants a compact elongated toilet or a round compact seat. Comfortability and safety is an important consideration for the seat shape. For a narrow toilet the seat will most likely be compact; whereas, standard, low profile toilets may be round. An added feature that one may consider when shopping for a compact toilet for small bathrooms is whether the seat itself can be interchangeable – if so, this does open up the options for a compact toilet. While the name says it all – compact toilet, it is still important to consider the overall space that one has to work with when purchasing a compact toilet for small bathrooms. One thing to consider is the measurement from the front to the back of a toilet, some may be not take up that much space or they may be awkward to install; therefore, knowing where and how you plan on installing the toilet will help when doing the research before the purchase. Compact toilets may be ideal for a tiny house with minimal space and the best way to add functionality and space is to go with a toilet suitable for small space – but it is also just as important to ensure you know the exact space you have to work with. When it comes to the compact toilet, height can be an important consideration especially if users of the compact toilet are the elderly or they lack mobility. While they may be compact, they don’t necessarily have to be a low height toilet – if anything, a compact toilet can have the characteristics of a standard height toilet. It is important when purchasing a compact toilet that if one chooses to go with a short toilet, they make sure no one will be uncomfortable using it. Choosing to go compact means purchasing a small tank toilet in comparison to standard tank toilets that can be add extra length from back to front. Going with a compact toilet means some brands will offer a smaller tank that doesn’t jeopardize functionality or aesthetic appeal. Picking a compact toilet for small bathrooms means considering the tank as well. When buying a dual flush toilet- whether it be tankless, wall-hung or technologically advanced or even ADA approved – testing the unit can prove beneficial and even essential. Knowing the amount of space, the type of plumbing or wiring needed will help with making the right purchase. Knowing something such as the plumbing can help ensure that the water pressure will be no issue, especially when it comes to a dual flush toilet. Most toilet brands will offer a single flush while also offering a dual flush alternative. Purchasing a dual flush toilet is often a smart investment for those conscientious of water consumption but feel that a dual flush system may jeopardize quality. It does not, consumers can rest assured that the quality is there and all that is left to consider is the features as well as appeal and style desired. Not only is the outer appeal important but choosing one that will offer comfort in seating, height and feel. Selecting a compact toilet and factoring the reduction in height and considering the shape of the bowl will enhance the comfortability and support of a toilet for a user. No matter your budget, we at Best Toilet Guide break down the pros and cons of the best units available. From toilets certified as WaterSense to two-piece and one-piece models, pick a toilet that not only matches your budget but your needs as well. Don’t be limited the next time you are on the lookout for a toilet—consider factors such as height, which can impact not only the placement of the toilet but also the functionality of a single or dual flush and accessibility of it as well. Other factors that might not be as important to some are colour, shape, and if the lid has a built-in closing mechanism preventing it from slamming when closed. These added features and ratings can enhance a toilets functionality and also its safety features, which for some toilets can mean it is suitable in family and elderly home residences. The next time you search for a new toilet, remember that just because it’s a higher-end model, doesn’t mean it’ll meet your needs. Always consider what you are looking for before making that purchase, or you just may be flushing your money away.